Viewing topic "Using the Cubase Effects on seperate Moxf Vst-tracks?" When I try to use the “build-in” Cubase effects on a Moxf (VST) track within Cubase, it’s applied to all the tracks I use the Moxf on. I’m struggling how to separate an effect on a specific channel I’m using a Moxf instrument on. Are you talking about audio or MIDI inserts? The audio from your MoXF will be mixed down to one stereo from all your parts, so they will all be affected. 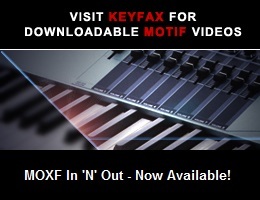 I have my Moxf connected thru a Usb-cable, so I make use of the Moxf-Editor in Cubase. I assume this would be a Midi insert. N.b. From within the Moxf editor I can adjust the “pan, volume, equalizer etc. But if I change an effect (also from within this editor) all the tracks are adjusted. To get a balanced atmosphere between all the tracks (Moxf and other Vst’s) I would like to make use of the build-in effects in Cubase. Sorry for my lousy English btw. As zpink says, all your audio is coming out of the same physical USB output, even though it might be split up into individual parts musically, so there’s no way to stop instances of plugin fx in Cubase affecting all of that audio. It’s normal practice to record individual midi tracks to audio tracks in Cubase when you are happy with them, and then you can have full ‘split up’ control over which of those audio tracks will feature fx plugins and which of them won’t. For example, Piano on its own audio track and then Bass on its own audio track, and so on. I tend to use my Cubase and MoXF in the same way as you, VST editor as a 16 part VST instrument in Cubase. It isn’t strictly speaking a VST instrument though since all the processing takes part on the board itself and is returned as a stereo mix-down. We still have the convenience of having all our settings and any sounds we’ve created loaded at startup :-). I’m 100% with Phil on the approach of solo-ing the MoXF parts and record them individually once you’re happy with the arrangements and voices on the board itself. I know it’s a bit of extra work, but it’s quite handy to have the stems saved and you’re then free to add your audio inserts. I see what you mean with the “splitting” the Moxf tracks and have a look at it. But finally I had the guts to adjust the different effect settings from within the Moxf-editor itself. Sounds weird, I know but as I had a freight load of problems connecting my Moxf to Cubase I was afraid to alter any setting which could mess up my connection. Anyway, I’m one step forward again and will experiment with separating the different channels for my Moxf. I also will look into the cc functions in Cubase. I already managed to adjust the tempo and even the volume...(I know, I’m great! LOL!). Slowly but surely my compositions are starting to sound audible and with a regular visit here I’m making progress. Thanks again for your advices and have fun making music. P.s. I really love my Moxf even if it isn’t showing all it’s possibility’s in one glance. It still beats a lot of instruments that are for sale on the market for ‘moucho’s dinero’s’. I’m using my setup a lot like that, creating/changing voices including f/x from the VST editor. That way, your changes are part of your Cubase project and as long as you don’t save it on your MoXF, you actually haven’t changed any of your user voices. The next reboot it will be reset to which ever state it was in at your last ‘Store’ until you load your Cubase project again. Of course, when you’ve created that awesome sound that you want to use in other projects or stand-alone, you will have to either store it on the MoXF or save it from the editor. I’ve had mine for a couple of years now and I’m still newbie on it! Before that I worked for a half Dutch company! I wanted to thank you again for your reassuring reply on sept 28 and your advices in general. I’m currently experimenting the crap out of my Moxf and enjoying composing with it. Tonight I’ve been reviewing the progress I made on my YouTube-channel the past months and noticed I learned quite a lot thanks to the assistance on this forum. @ Zpink: If you worked for a (half) Dutch company I might as well answer you in Dutch right? “Heel erg bedankt voor je advies en je geruststellende woorden met betrekking to mijn Moxf”. Hahaha, my Dutch is VERY weak since both my former and current Dutch masters have had English as the main/business language. I DO understand some since it seems to be a mix of Scandinavian and German words thrown in there. Not enough to follow full conversations though! I’m glad that you’re making progress and is enjoying your MoXF.